This Valentine’s Day mix yourself up some love, whether you have a sweetheart or not. 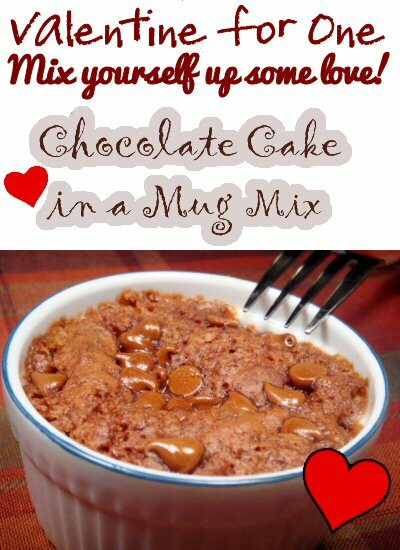 Have yourself a lovely little mug cake in less than five minutes. Even if you have to work, you can make the mix at home and bring this in (be warned, you may want to make the bulk mix to share – who doesn’t want their own warm little cake at work?). Or if you are clueless and this is your first Valentine, this is super easy and makes a tasty gesture. You could even package this up as class gifts. And if you are a mom of multiple littles, you could sneak this into the bathroom/closet/car to scarf for your chocolate fix. Mix with 2 Tbl water (or milk if you want it more cakey) in a bowl or mug. Make sure you get those corners on the bottom mixed. If you are at work or otherwise left without measuring implements, you want this to be the consistency of a thick cake batter. For most mugs you can double this and it will fit, it does rise a tad. You can add chocolate chips if you prefer. Cook in microwave for 40 seconds (it takes longer if you double it or use milk). If it still looks wet keep cooking for 10 second intervals. Your cake should look dry on top. If you aren’t sure use a fork to pull the side of the cake away from the mug and see if the bottom is wet. No raw egg, so a little wet won’t hurt you. You don’t want to overcook these. *You can leave out the dry milk and substitute milk for the water. 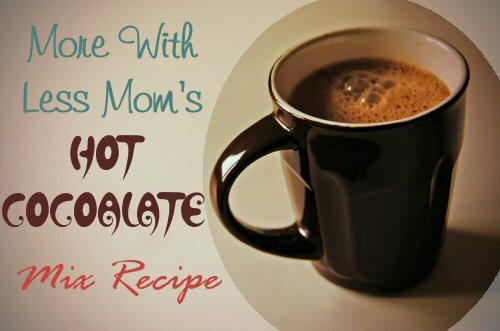 If you have some baker’s chocolate in the house you can whip up some better-than-the-mix hot chocolate, as well! Go for the gold with this one! 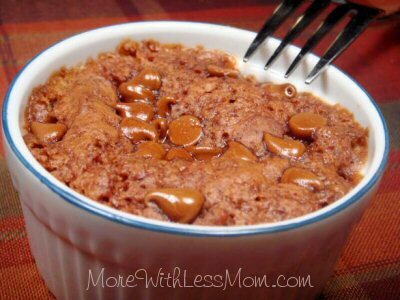 Mug cake Lori Mama on Food.com Thans Lori! Simplicity, but love it….much better than a cup of tea! Love this! I’ve been searching for a recipe like this to convert to gluten free and this is a winner for sure! Ohh let us know how it comes out, I’d link to that!